If you are not currently using or familiar with a sectional sno pusher, they are quickly becoming a popular type of plow used among snow removal professionals. 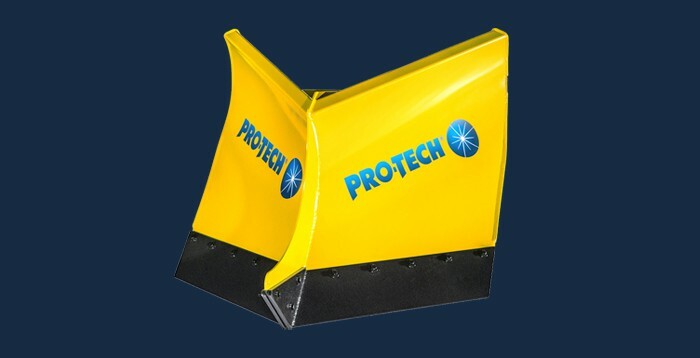 While a simple rubber edge snow pusher is still the most commonly used type of containment snow plow, sectional snow pushers are creating a buzz. Does it make sense for your business to own a sectional sno pusher? Is it worth the investment? Read below to find out. Snow pushers, also called containment snow plows, have been used for decades. These types of snow plows differ from standard truck plows in that they have sides. The sides allow for the collection and “pushing” of snow. 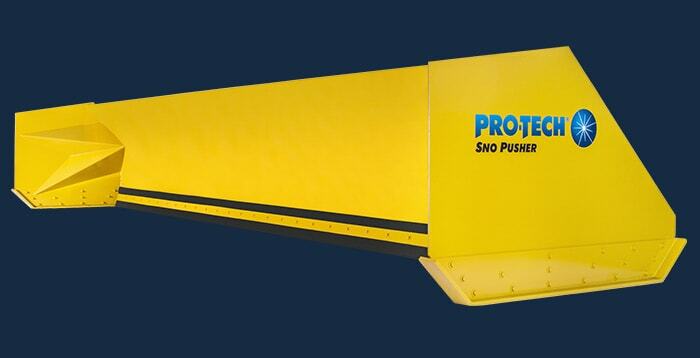 When compared to truck snow plows, snow pushers are larger and can move more snow in one push. Snow Pushers also provide an opportunity for landscapers and construction companies to use their idle equipment such as loaders, backhoes, skid steers, and tractors to make money during the winter months. The booming expansion of retail parking lots in the 80’s plus the benefits over a truck plow, aided the snow pusher in its popularity. In the 90’s, Pro-Tech became the first company to sell large standardized quantities of snow pushers through dealers across North America. 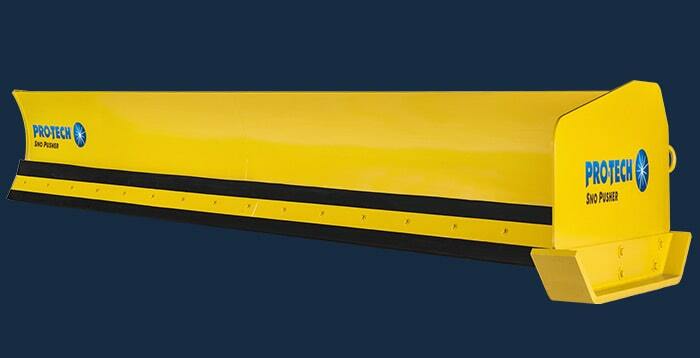 Since then, the rubber edge snow pusher has been a staple among commercial snow plow companies. In recent years, property managers have required better surface clearance and less snow left behind on their parking lots. 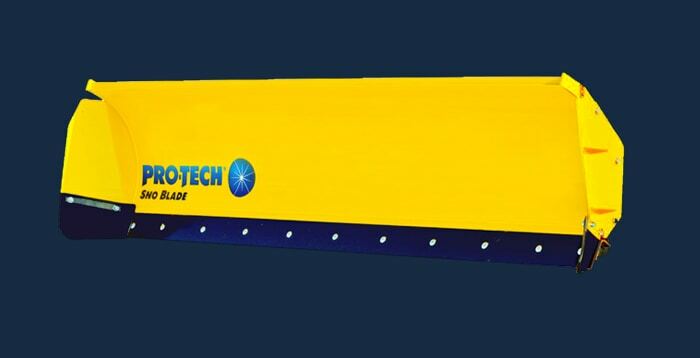 In most situations, a rubber edge snow pusher will clear all types of snow. However, some heavily trafficked properties can create hard pack, which is difficult to remove. With rising salt prices and regulations, contractors looked for another solution. 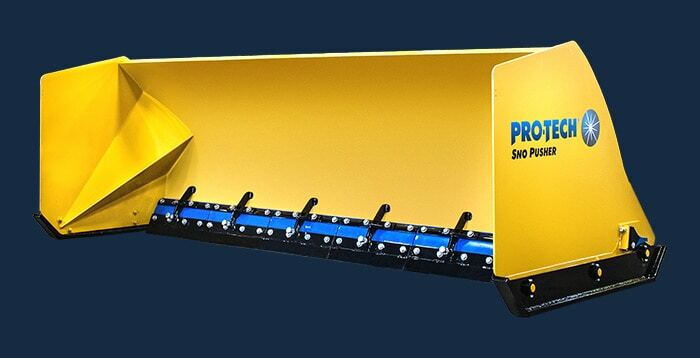 Some sectional sno pushers feature complicated steel trip edges and a moldboard that is split into several foot sections. 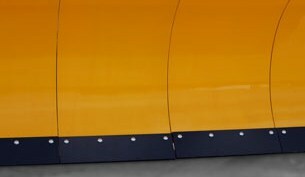 This design allows the plow and edge to contour to surface variations. 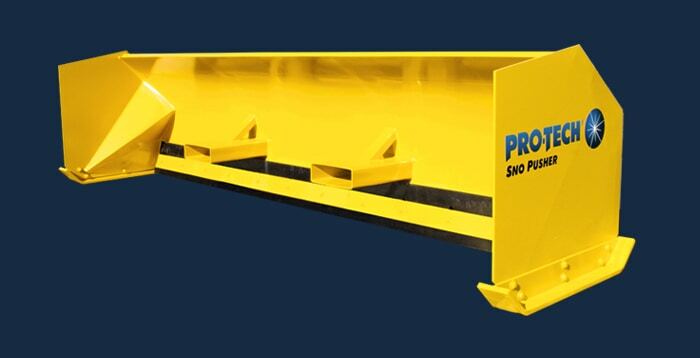 The steel spring trip edge can trip over obstacles. Some versions also have floating sides. The downside of these plows is that they can be expensive, have limitations when stacking snow, and require maintenance more often than other designs. 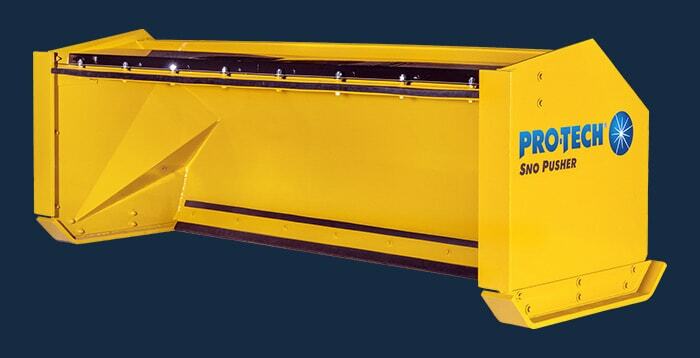 This style of sectional sno pusher is the luxury sports car of containment snow plows. They work great, are typically built very well, but will cost you a fortune. Maintenance can also be a huge expense if being run by subs or inexperienced operators. 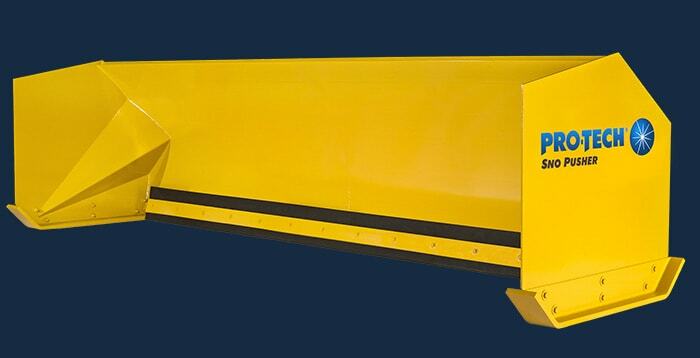 Hydraulic sectional snow pushers have wings that can angle, allowing you to both contain or windrow snow. Their edge systems are often complicated (in a good way) and can achieve maximum surface clearance. While this style certainly has benefits you will need to be ok with the massive price tag in order to own one. 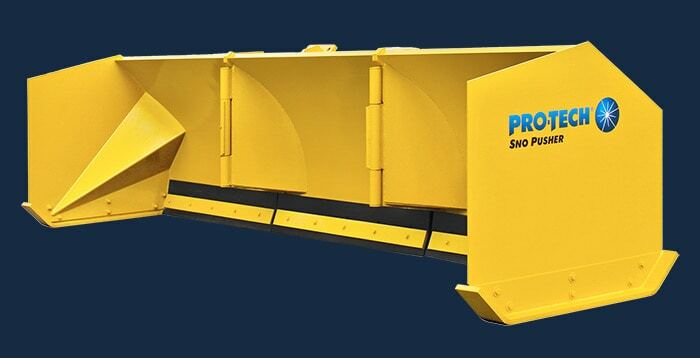 The majority of sectional sno pushers feature a trip edge that uses a combination of steel components and complicated designs. However, some snow pusher manufacturers have taken a different approach. 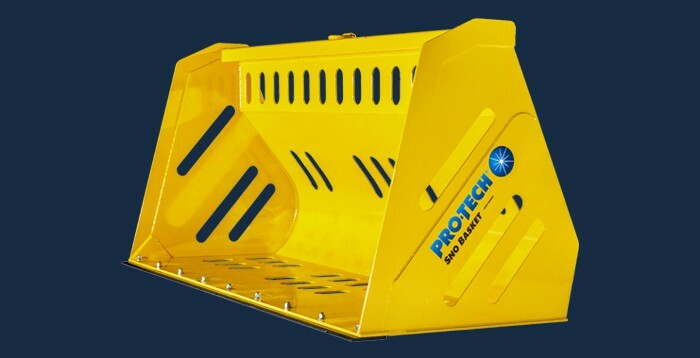 The Steel Edge Sno Pusher from Pro-Tech has a sectioned trip edge that uses a polyurethane hinge as the trip mechanism. This keeps the design simple, the maintenance limited, and still gives you the desired performance. 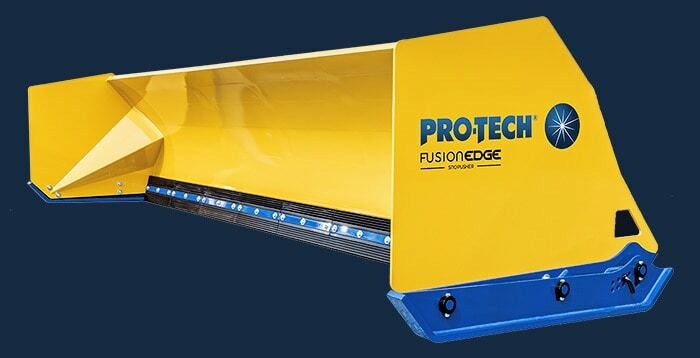 A unique addition to sectional snow pushers this year was the introduction of the Fusion Edge Sno Pusher. 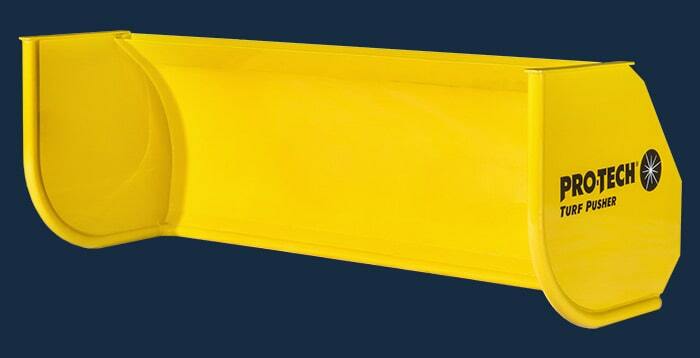 The Fusion features a steel infused rubber cutting edge that comes in 2ft sections. 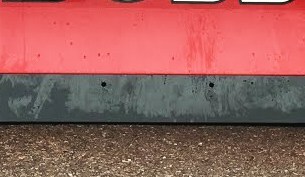 The combination of steel and rubber allow the edge to squeegee wet heavy snow and scrape hardpack. This new edge in combination with a floating coupler, adjustable shoe, and durable chassis has resulted in the Fusion Edge selling out before winter even started. 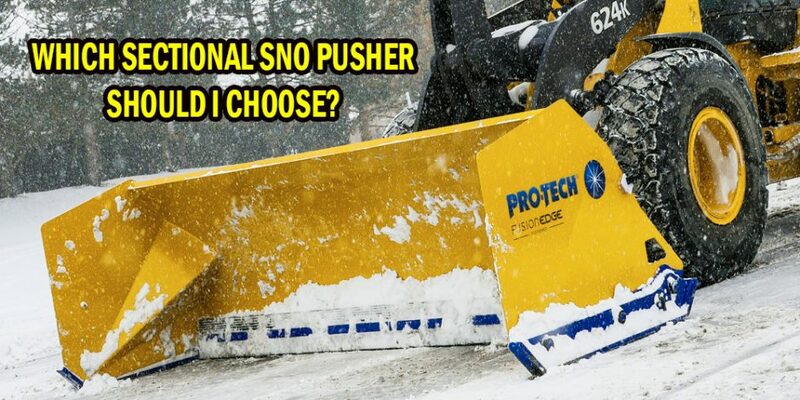 So now that you know what’s available, which sectional sno pusher is best for you? Honestly, it all comes down to answering a few questions. What works for some will not work for others. Are you the type of person that doesn’t mind replacing equipment every season or every few years? Is money a concern? What type of surface outcome do your properties require? Are you concerned about salt usage? 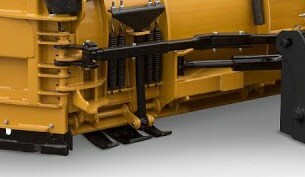 Do you have a team that can perform maintenance on some of the more complicated plows? Will you spend more money to get increased performance and functionality out of a plow? If you haven’t figured it out yet, this is an article written by a Pro-Tech employee. We believe that the best answer is one of our products and wouldn’t be doing our job if we said otherwise. After being the top snow pusher manufacturer in the country for 25 years, we are confident that our products have the perfect blend of performance, ease of use, and price. But this isn’t our decision, it’s yours. Please take the information above and do research on which sectional sno pusher is best for your company. Happy plowing. Here are some other snow pusher manufacturers that you might want to research. Find out why companies choose Pro-Tech!